At Jacaranda Cottage we believe in providing a holistic environment, a home away from home, creating a sense of rhythm, balance and calmness, a feeling of safety, belonging and familiarity and an overall sense of harmony and wellbeing for all who come into our centre. The design and presentation of our spaces both indoors and outdoors are thought through with careful attention to every detail from colours, textures, fragrance, light and reflection to the sounds, displays, organisation and personal touches. A rich variety of quality open-ended resources and a good balance of natural materials are used to enable purposeful learning that will inspire children to explore, create, problem-solve, imagine and discover. Each space has its own unique personality and is respectful of each child’s stage of growth. Our infants room is a cosy space flooded with natural light streaming in through the bi-fold doors which open onto its own covered veranda. The room is designed with soft colours and textures and an emphasis is placed on sensory experiences. Two trained staff members care for the individual needs and routines of eight children a day creating a secure, safe and relaxed environment for each child to gain a sense of belonging and nurture their inquisitive nature. This room also has the added benefit of a third staff member who works between both the infants and toddlers room. A welcoming space with cosy areas and the benefit of a peek a boo window which looks through to the preschool room giving the children the option to say hello to their siblings. Our toddlers room is a lively fun space and is designed to be flexible enough to change the learning opportunities as the year progresses and children develop their independence. Two trained staff members care for eight children a day encouraging their learning and supporting their unique characters to emerge by providing a wide choice of activities and experiences to fully engage their sense of wonder and understanding of their world. This room also has the added benefit of a third staff member who works between both the infants and toddlers room. Our 2-3 years olds enjoy a beautiful quiet and intimate classroom with access to their own large private covered veranda that overlooks two gardens. The room has a wonderful homely atmosphere and a unique feel with great attention to detail in its overall presentation. Two trained staff members cater for ten children a day inspiring a love of learning by providing a balanced, holistic choice of activities that encourage and support each child as they transition from toddler to preschooler and develop their own uniqueness. This room also has the added benefit of a third staff member who works between both the transition and preschool room. Our preschool room is the largest of our rooms, light filled and spacious with its own beautiful, inspiring art studio. The classroom has been designed with several cosy nooks and smaller spaces to allow the children to work independently or in groups. There is a strong arts and nature focus throughout the room with each area inviting the children to use their imagination and creativity, and extend on meaningful play. Four trained staff members care for 24 children a day creating a rich learning environment that emerges organically from the children’s ideas and interests and where time is given to immerse themselves in play and personally connect to their own learning. In addition, our team also consists of Annie who works in our kitchen and four permanent staff who provide consistent care across the centre replacing staff while on holidays, programming and days off. We have three wonderful garden spaces designed with each age group in mind, all providing their own organic learning opportunities and connections to the natural world. There are intimate spaces for just being, large spaces for active play and all spaces allow children to use their endless imagination and become deeply involved in uninterrupted play. 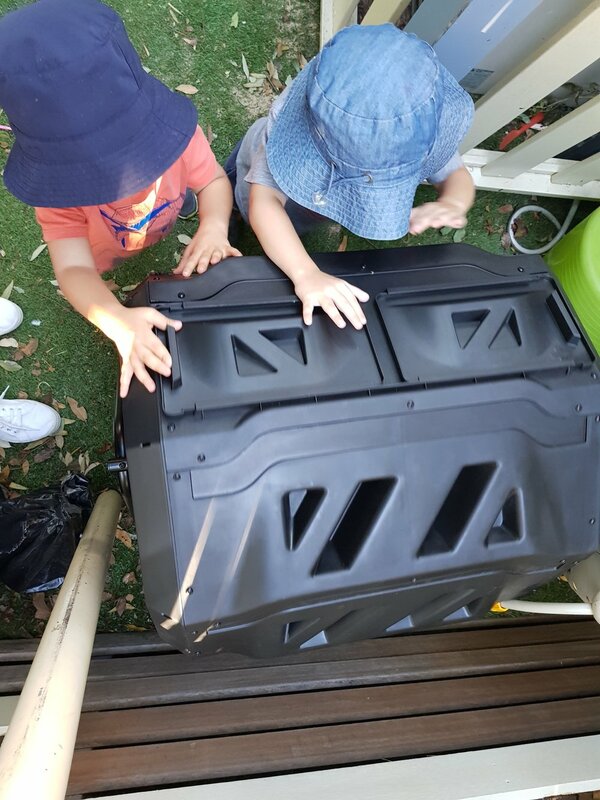 Children are encouraged to discover the beauty of nature by exploring our edible herb and vegetable gardens, using natural materials in play, enjoying books and art under a shady tree as well as the sensory experiences our garden has to offer such as sand, dirt and water. Children engage in gardening, growing, harvesting and eating food from our garden and are encouraged to take part in the real work of the day by caring for our worm farm and the watering of our native plants which attract bugs, birds and butterflies. We learn about sustainable ways of living and treading gently upon the earth and create our own sense of place through our Jacaranda tree where we celebrate its flowering each year in a unique community festival.